Just last week, we got a good look at the “Self Healing” backside on the G Flex from LG, but given the video was straight from the manufacturer, it hardly ever relates to real world usage. Our buddy MKBHD got his hands on the new device from LG and decided to test out the self healing functionality himself. 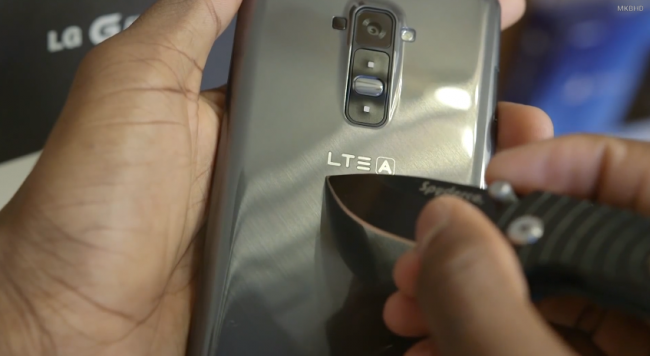 With the help of some normal keys and even a pocket knife, we can see just what the G Flex is made of. As we can see in the video, after being scuffed and scratched by the keys, the backside has little problems returning back to a normal look after a few minutes pass. When it comes to cuts and deep scratches from a knife though, the device does its best to look good, but it isn’t be able to revert back to perfect condition. As pointed out by Marques in the video, the material reacts very well to heat, which should speed up the healing process. So, if you drop your baby and you see some scratches, try rubbing them out. That sounds dirty. Make sure to check out the MKBHD YouTube channel for other great tech videos.